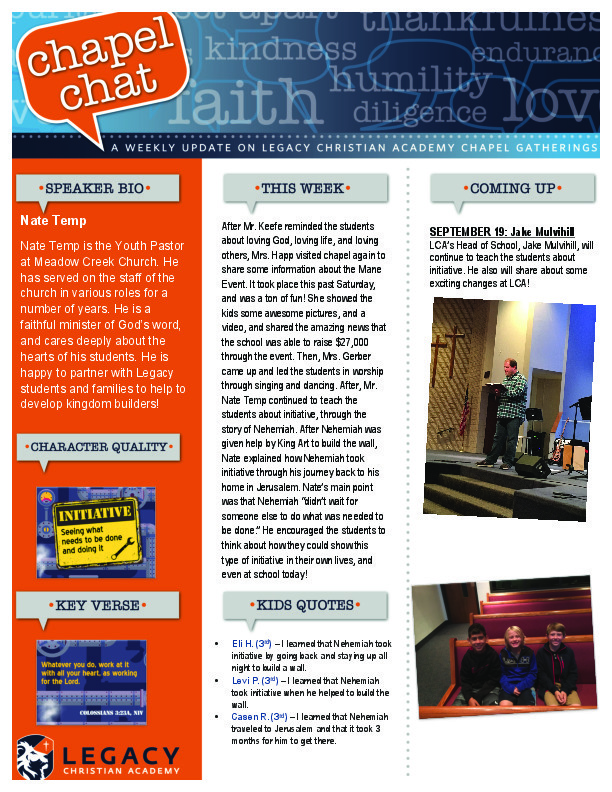 Chapel Chat is a weekly publication for K-4th grade students and parents. 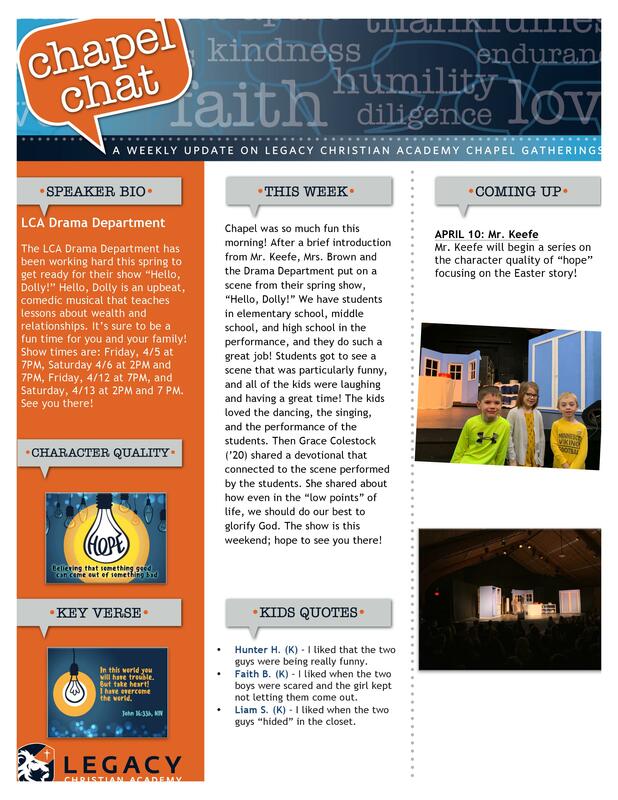 It is our prayer that you will use these Chapel Chats as springboards for launching into biblical discussions with your children when you are in the car, at the dinner table, or having family devotions. 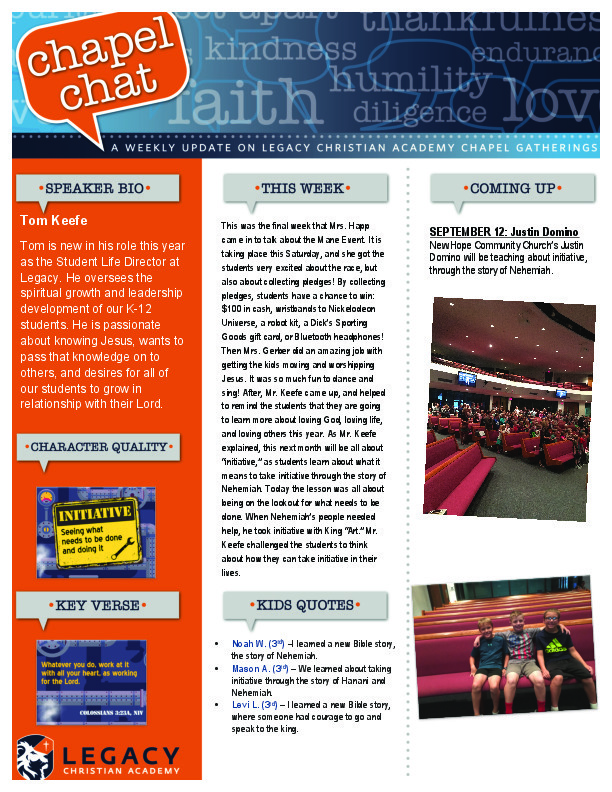 You could even use the worship song links in the PDF to have a little family worship time! Feel free to use as much or as little as you want. We simply want to continue to partner with you in raising up our children in the knowledge and love of God! Mr. Nydam told the story of when the disciples found out about the empty tomb. He taught that many of the disciples trusted that Jesus rose from the dead. After talking about the importance of trust, Mr. Nydam took four brave volunteers to perform a “trust fall.” He talked about how if we know someone, then we will be more likely to trust them – if we know Jesus we will trust in Jesus and we can have hope in the salvation that He gives us. It was a great Easter lesson as we plan to celebrate this weekend! Mr. Keefe introduced the new word for the month, “Hope.” Hope is the belief that something good can come out of something bad, and today Mr. Keefe explained this idea through the story of Lazarus. John 11 tells the story of how Lazarus dies (something bad) and Jesus raises him from the dead (something good). Not only was Jesus showing that he was the Son of God, but he was showing that he had power over sin and death. loved the dancing, the singing, and the performance of the students. Then Grace Colestock (’20) shared a devotional that connected to the scene performed by the students. She shared about how even in the “low points” of life, we should do our best to glorify God. We closed up our month discussing the importance of individuality. Today, we talked about the story of the anointing of King David in 1 Samuel 16. The prophet Samuel is told by God to anoint a new king of Israel. Samuel makes an assumption that God will choose the king based on the physical appearance. Instead, God says to Samuel “For the Lord sees not what man sees: man looks on the outward appearance, but the Lord looks on the heart.” The story ends with David, the youngest (and smallest) son being chosen to be king over God’s nation because of his heart. In the same way, God wants us to see what really matters. When kids think of themselves, they often think about things on the outside, but God cares about the inside. The kids were tasked with giving instructions to Mr. Keefe on how to make a PB + J, and Mr. Keefe took their directions VERY literally. Mr. Keefe’s point in doing this crazy activity was to show the students that their voice is able to make a difference. What they say has a major impact on others and God made our students to make a difference, even now while they are young! Then Mr. Keefe gave a brief summary of the story of Paul and Timothy. Specifically, Paul wrote to Timothy and said, “Let no one despise you for your youth, but set the believers an example in speech, in conduct, in love, in faith, in purity.” (1 Timothy 4:12) It is so important for our students to believe that God made them to make a difference. After a great worship time with Mrs. Gerber, we started a new series on individuality. This month we are going to discover who we are meant to be as people of God. One of the fundamental things that we need to understand as God’s people is that He wants to have a relationship with us. That was the focus of the lesson today, as we learned about the Parable of the Lost Sheep in Luke 15. Through the parable, we learn that because we are God’s children, He will not stop in His pursuit of our hearts. What a fun day in chapel! Mrs. Gerber began chapel by leading the students in a Christmas sing-along. Mr. Keefe then led a lesson on the importance of sharing the good news of the birth of Jesus. Just like the angels shared the good news with the shepherds, a way we can share compassion on others is sharing the good news about Jesus Christ. Lastly, we got to see the results of our blanket drive during the past week. The school was able to donate over 370 blankets and raise $700 for the homeless in the Twin Cities! It was an amazing effort! Both middle school and high school choirs shared a small sampling from what they will be performing on Thursday night during their concert. The students really enjoyed both groups, as they were able to participate through singing and clapping. All of the songs provided an amazing opportunity for our students to hear about the real meaning of Christmas, the coming of our Savior Jesus Christ. It was also awesome for our students to witness how we can love God and love life through song! Mr. Rudzitis led the middle and high school bands in performing for the children. Both groups performed a number of Christmas songs that got everyone into the spirit of the holiday. There was clapping, singing, and rejoicing as the songs that were performed celebrated the coming of our Savior! This year we are learning about how to love God, love life, and love others, so today was a great chance to see older students do that through using the gifts that God has given them. Today, LCA senior Alaina Johnson taught the students about cooperation through the story in Exodus of the building of the Tabernacle. After doing some tent-building of their own, the students learned all about how God asked the Israelites to cooperate in order to build the Tabernacle. God gave certain Israelites specific responsibilities in building a place that was ultimately designed to worship Him. Alaina taught that we can do more together than we can do alone. In addition, the students learned through the story of the Tabernacle that God is pleased when his people work together. Today the students were able to love God, love life, and love others by watching the 5th and 6th graders put on “A Not-So-Terrible Parable.” The students did a good job with the show, the singing was good and there was so much biblical truth packed into the performance. The story is a version of the Parable of the Good Samaritan set in 1939. Through the story, students were able to see and understand the power of loving their neighbor. The show focused on kindness, and the way that Jesus loves in a way that’s so different from the world. 11/7 - Drama Performance "The Frog Prince"
Today was a special day in chapel as elementary school students got to watch our Advanced Drama class perform a scene from their fall show, “The Frog Prince.” In the scene the students saw the Princess make some promises to the Frog that she does not keep. After chapel, Mrs. Brown (our Drama Director) came up and shared how in the story the Princess was not loving or kind to the Frog. She talked about 1 Corinthians 13, in which God commands us to love each other with kindness and honesty, and not to treat others like the Princess treated the Frog. 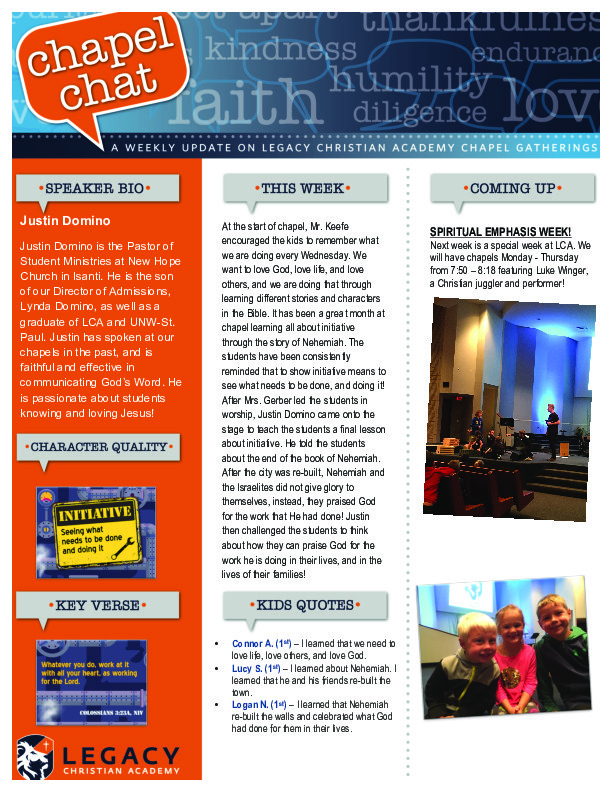 For our lesson today, Jacob did an awesome job closing our month on contentment. We learned about the story of the Israelites in Exodus 16 and Exodus 17. The main idea related to this story was that we should not “miss out on what we have now.” Jacob began his lesson with an awesome illustration where students had to follow his instructions, and he also challenged the students to think about things that they should not miss out on right now. Mr. Nydam continued teaching about the character trait of contentment by highlighting the big idea for the month. This week, Mr. Nydam used the story of King Ahab and Queen Jezebel in 1 Kings 21 to emphasize that “wanting what others have can make you miserable.” Mr. Nydam challenged the students to think about how they could be content in their own lives. Our hope is that these character traits can make an impact in the lives of our students now, and will also stay with them as they continue to develop into disciples of Jesus! Mr. Keefe taught “stuff can’t keep you happy.” These students are living in a world where they are surrounded by messages regarding things they supposedly “need,” and because of this, Mr. Keefe taught two important and connected ideas. First, that even if students got everything they ever wanted, they still wouldn’t be happy. Second, this is because our hearts were not designed to worship our things, but instead to worship our God. Rejoicing in Him, and living the way He desires, is truly what brings us the most satisfaction. If our kids can understand these two important truths, they hopefully can be content with what they have. We want to encourage the kids this month to decide to be okay with what they have. We believe that content hearts are grateful hearts, and our hope is that kids ultimately find their contentment in what Jesus has done for them. This was the main message that Mark Katzenberger brought as he kicked off our new theme for the month of October. It was such a joy to have Luke Winger partner with us this week! 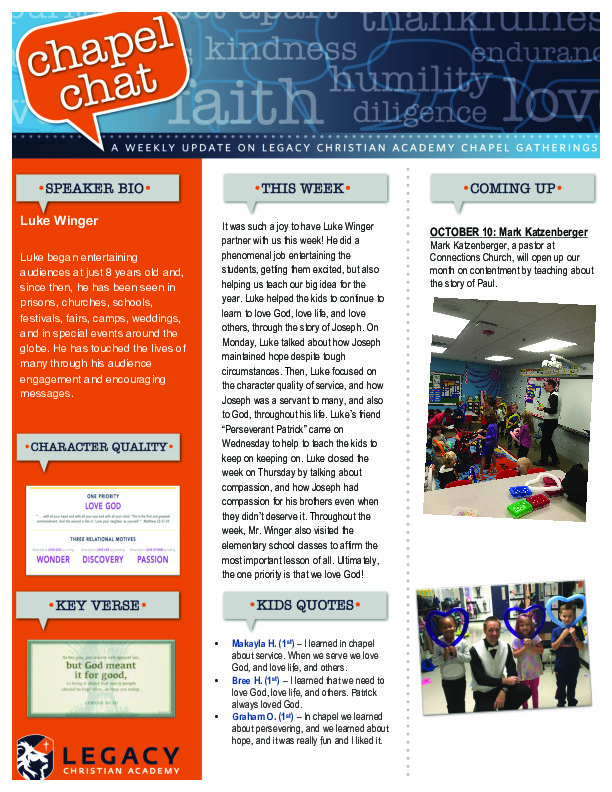 Luke helped the kids to continue to learn to love God, love life, and love others, through the story of Joseph. On Monday, Luke talked about how Joseph maintained hope despite tough circumstances. Then, Luke focused on the character quality of service and how Joseph was a servant to many, and also to God, throughout his life. Luke’s friend “Perseverant Patrick” came on Wednesday to help to teach the kids to keep on keeping on. Luke closed the week on Thursday by talking about compassion, and how Joseph had compassion for his brothers even when they didn’t deserve it. Throughout the week, Mr. Winger also visited the elementary school classes to affirm the most important lesson of all. Ultimately, the one priority is that we love God! 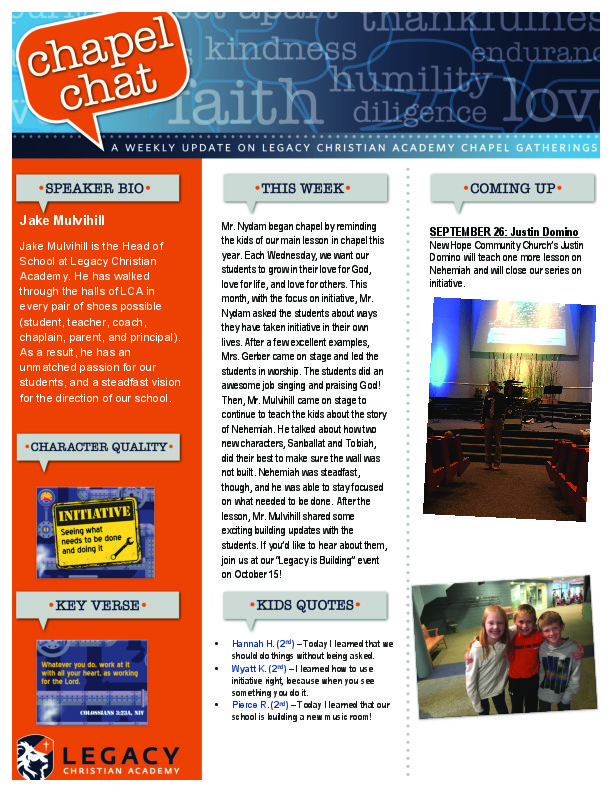 It has been a great month at chapel learning all about initiative through the story of Nehemiah. The students have been consistently reminded that to show initiative means to see what needs to be done, and doing it! Justin Domino taught the students a final lesson about initiative. He told the students about the end of the book of Nehemiah. After the city was re-built, Nehemiah and the Israelites did not give glory to themselves, instead, they praised God for the work that He had done! Justin then challenged the students to think about how they can praise God for the work he is doing in their lives, and in the lives of their families! Mr. Mulvihill continued to teach the kids about the story of Nehemiah. He talked about how two new characters, Sanballat and Tobiah, did their best to make sure the wall was not built. Nehemiah was steadfast, though, and he was able to stay focused on what needed to be done. After the lesson, Mr. Mulvihill shared some exciting building updates with the students. 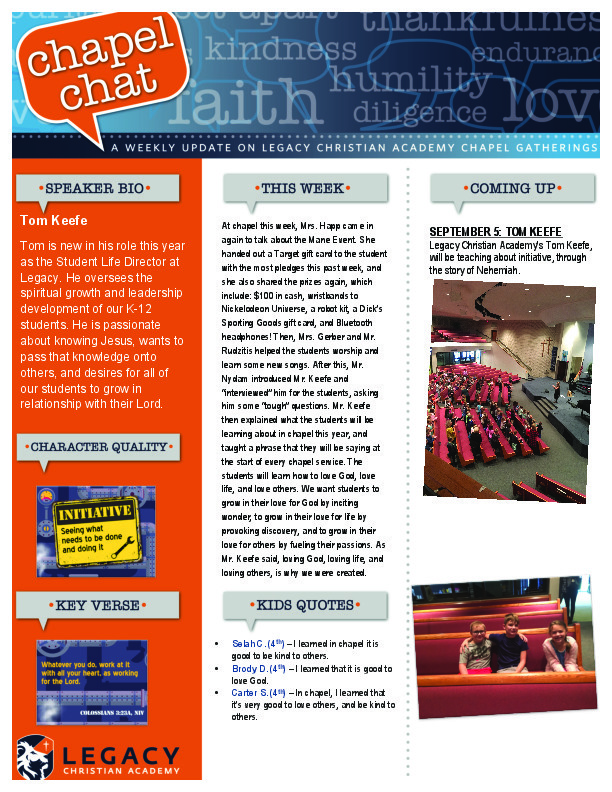 If you’d like to hear about them, join us at our “Legacy is Building” event on October 15! Mr. Nate Temp continued to teach the students about initiative through the story of Nehemiah. 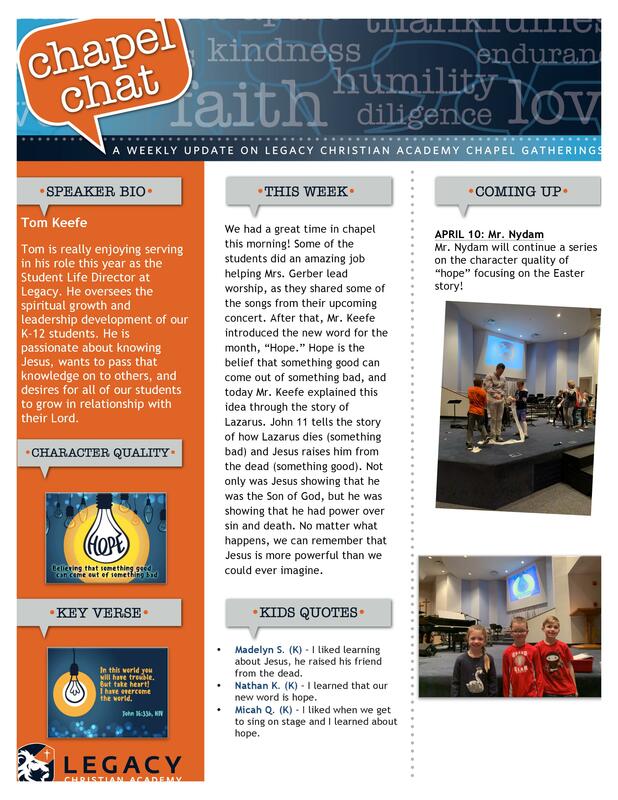 After Nehemiah was given help by King Art to build the wall, Nate explained how Nehemiah took initiative through his journey back to his home in Jerusalem. Nehemiah “didn’t wait for someone else to do what was needed to be done.” He encouraged the students to think about how they could show this type of initiative in their own lives, and even at school today! Mr. Keefe helped to remind the students that they are going to learn more about loving God, loving life, and loving others this year. 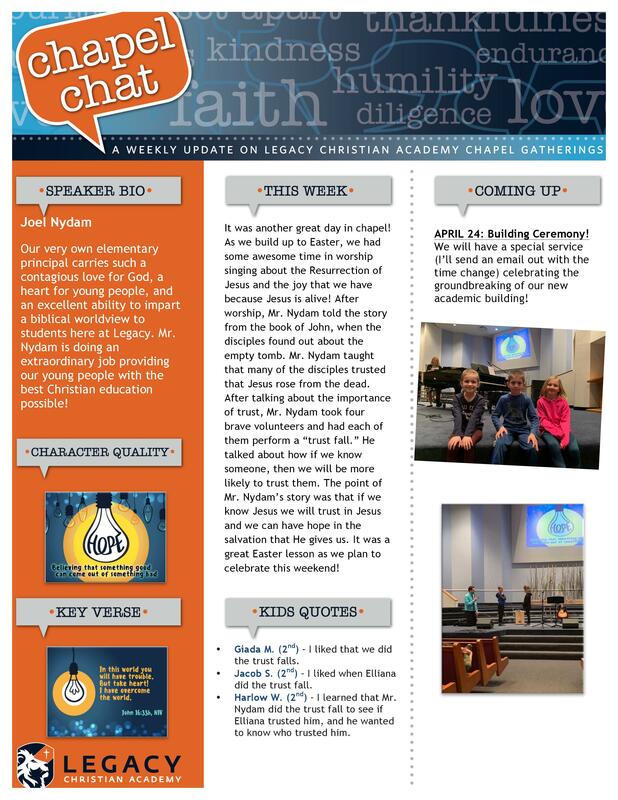 As Mr. Keefe explained, this next month will be all about “initiative,” as students learn about what it means to take initiative through the story of Nehemiah. Today the lesson was all about being on the lookout for what needs to be done. When Nehemiah’s people needed help, he took initiative with King “Art.” Mr. Keefe challenged the students to think about how they can take initiative in their lives. Mr. Nydam introduced Mr. Keefe and “interviewed” him for the students, asking him some “tough” questions. Mr. Keefe then explained what the students will be learning about in chapel this year, and taught a phrase that they will be saying at the start of every chapel service. The students will learn how to love God, love life, and love others. We want students to grow in their love for God by inciting wonder, to grow in their love for life by provoking discovery, and to grow in their love for others by fueling their passions. As Mr. Keefe said, loving God, loving life, and loving others, is why we were created. We had an amazing time worshipping God and thanking him in this first week of school! 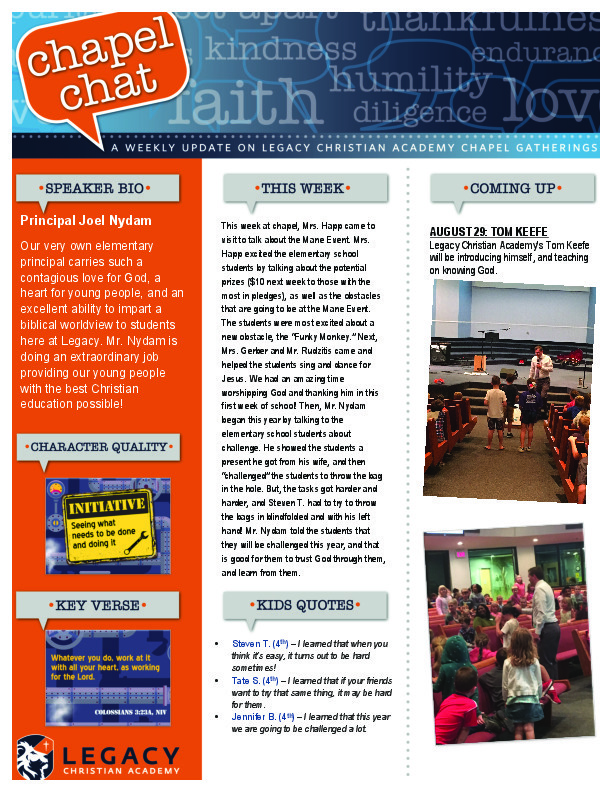 Then, Mr. Nydam began this year by talking to the elementary school students about challenge. He “challenged” the students to throw the bag in the hole. But, the tasks got harder and harder, and Steven T. had to try to throw the bags in blindfolded and with his left hand! Mr. Nydam told the students that they will be challenged this year, and that it is good for them to trust God through them, and learn from them.